Hey there! Thanks for dropping by walkingwithweezy! Take a look around and grab the RSS feed to stay updated. See you around! The boys came home with perfectly created homemade goodies to shower mommy for mother’s day. It’s always a sweet, enjoyable moment to reflect on their growth, love, maturity, sweetness, and more in the past year. I still long to be a stay at home mommy and I hope some day the Lord will honor that, but until then one thing I look forward to is seeing all the work they do while I’m away! I am constantly looking for ways to seek out the many blessings God has given me. Though God his not honoring my desire to stay home with them, and I’ve been waiting 6 LONG tearful years – there have been many things during that time HE has blessed. For the most part I’ve had very loving and giving care providers for them (minus one place where Owen landed in the hospital twice..one of those times I KNOW could have been avoided). A few minor accidents, trips to the ER, well this mama isn’t really complaining (other than..I still want to be home with them!!! hahaha). I look forward to seeing their faces light up and run to me every single day when I pick them up. I am tearful when I see them cry upon leaving them. I hurt, painfully, when my oldest son goes into meltdown mode because of his OCD and there’s absolutely nothing I can do to help. I plan things for him as best and most efficiently as possible but there are still moments that when his routine gets thrown off that his brain just goes haywire. I picture a morning where we can wake up, eat a family breakfast, learn about cooking, color together, do fun art projects, go outside and learn about God’s creation, go to the park, go to the zoo, all sorts of things. Instead we have an insanely hectic chaotic lifestyle that I dread so many days. I constantly try and remind myself of the Lord’s word in Ecclesiastes, to everything there is a time and a season. I’ve still not figured out why my season is so long – I know my youngest would be starting school in a few short years and at this point it’s impossible for me to stay at home with being a single parent. I must remain working. It’s God’s plan, I don’t like it…but it’s still His plan. Lord teach me to be more grateful and more accepting of that which you have given me and soften my heart. Porkchops…I got SO TICKLED!!!! From the mouth of a 2 year old I have to hand it to him, that was AWESOME!! I then went to pick up his older brother from school and he had a paper for me as well. Ironically, when asked what his mom’s favorite food was, he answered, “porkchops”!!! I thought that was pretty awesome too! His other answers were really sweet. She is __32__ years old and has __blue__ eyes and __brown__ hair. Her favorite food is: Pork Chops. 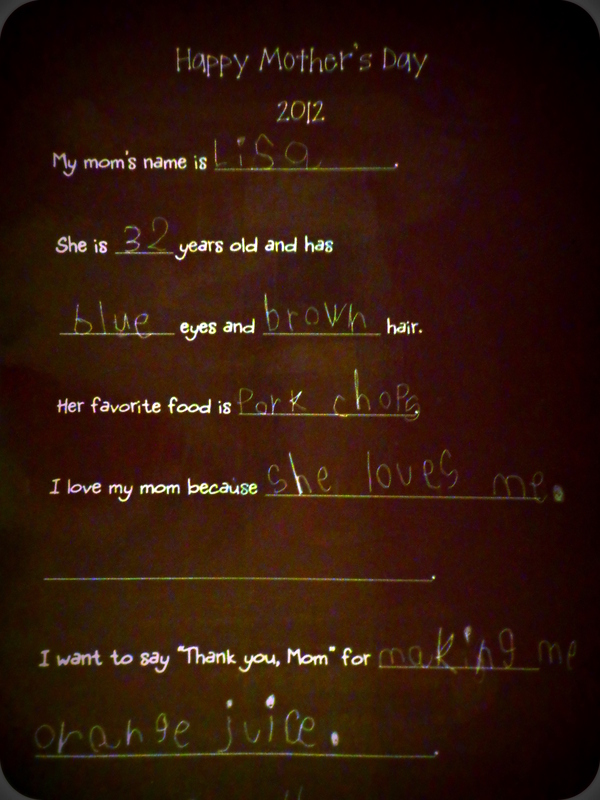 I love my mom because: She loves me. I want to say “Thank you, Mom” for: Making me orange juice. Serious mommy grin and love going on here. Thanking God for the little things and for simplifying life. No bouquet of flowers, kitchen appliance, jewelry, or any “thing” could have replaced these two sheets of paper today. Best of all both boys saying at different times and places that mommy’s favorite food was porkchops! !